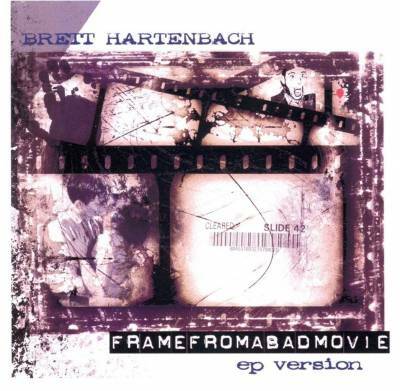 Brett Hartenbach sings five tunes on this long-awaited release. You may know Brett for his incredible guitar playing as a one-man-band backing band with Daniel Johnston. Brett, a friend of Daniel from his earliest song-writing years (and the guitar on some of Dan's oldest tracks), now routinely travels with Daniel on tours. If you'd had a chance to see any of those shows, you know that Brett is a terrific asset to Daniel, bringing new life to many of Daniel's old songs with his Dylanesque style guitar playing, and freeing up Daniel's to sing without the stress of playing. This album is a rare opportunity to see how Brett is a song-writer in his own rite on three of the tracks. The other two tracks are a cover of Joe Henry and one by Mark Hartenbach (Brett's brother, and the writer of the song "Whiz Kid" which Daniel sang on the "Laurie" EP in the 90s).